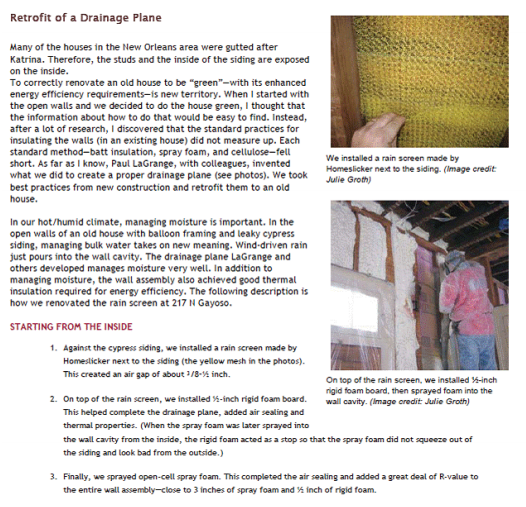 When we bought it at the end of 2009, my husband and I quickly noticed that the house was… shall we say… drafty. Having lived in a home that was built over a hundred years ago, I knew not to expect modern-day comfort but this was a whole different story. 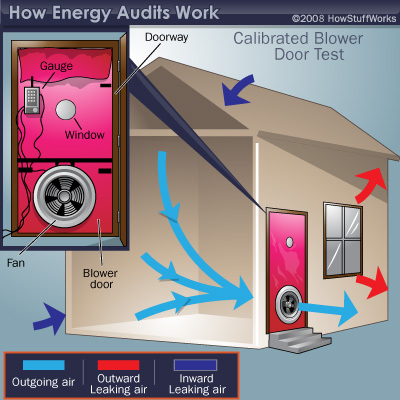 So, in anticipation of making some “energy improvements” on the house, we enlisted the help of an energy auditor to perform a “blower door test” (see image below). The results? Drafty was an understatement. Blower door tests require that a house be de-pressurized to a difference of, say, 50 Pascal before beginning to measure either the air ﬂow required to achieve that 50 Pascal or the number air exchanges per hour. Our auditor could not even get a reading of 50 Pascal to begin with (read, our house does little more than keep the rain out). It was an eye opening experience to say the least and I’m glad to have observed the process… it is one that I think the entire construction industry will have to familiarize itself with in the very near future. I say that because the “topic du jour” at this year’s CSI Convention was ‘high performance building’ and the looming possibility that the International Green Construction Code will be adopted as code in many municipalities (already adopted in Rhode Island!). As is currently the case under some States’ energy codes (mostly up North) or by some green building standards, the air ﬂow rate per square foot of a building must be range from 1 to 1.5 cfm/ft2. If the IGCC is adopted (which references ASHRAE 189.1), the required air ﬂow rate will be 0.4 cfm/ft2 (at 75 Pa) and building envelope commissioning (energy auditing) will be required! So, maybe it wouldn’t hurt to start getting those ﬂashing, penetration and transition details in order and update your air barrier spec!